Obamaniacs, Parody Song Lyrics of The Animaniacs, "Animaniacs (TV theme)"
The OS: http://www.youtube.com/watch?v=KA0TS9l_nJE and http://www.youtube.com/watch?v=lga3KNKqRDc, based upon "There's a Tavern in the Town". I'm not the only one to satirize this song with this title on the Internet, but I think I'm the first to do it here! We have won the White House back! From wrong side of the tracks. We’ve had it up to here with Bush and all his rightist stuff! (And) we like John McCain, but, well, he’s just not left enough! We can’t stand Sarah Palin; she really churns our guts! We voted for a mutt! He’s got brains and charm and tact! He will make the rich pay tax! He’s a hero to the blacks! He has a risky tongue. Don’t cross him, or you’re stung! We wear slogans on our backs! For the “Change We Need” attack! Fun to sing along to! I especially liked the Obama Girl reference. We've had it up to here with Bush and his incompetence, but can you make that rhyme? Pretty good stuff, Melanie, but your "He will make the rich pay tax" line seems a bit confused. The nation's top 5% of income earners earn 33% of the nation's income and they are already paying 57% of the nation's income taxes. How much more do Obamaniacs want them to pay? 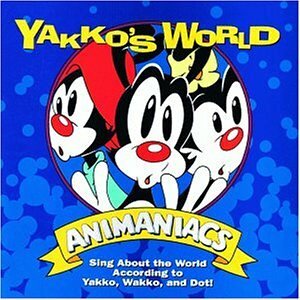 The address of this page is: http://www.amiright.com/parody/90s/theanimaniacs1.shtml For help, see the examples of how to link to this page.